After almost 36 hours at anchor in rough seas, race leaders The Islanders are underway again. While they have been resting up waiting for the north-easterly headwind to ease and for Gavin Sheehan’s back strain to recover, they have slipped behind world record pace. Good news is that tomorrow the wind will shift to the south in the Bristol Channel, making rowing much easier for the whole of next week. Savoir Faire, the only other team still chasing prize money in GBRow 2013 will now round Land’s End on tomorrow morning’s tide, to also take advantage of those southerly winds. Jason McKinlay and his partner Josh Tarr are well ahead of their personal schedule and will cross Mount’s Bay, off Penzance, tonight. 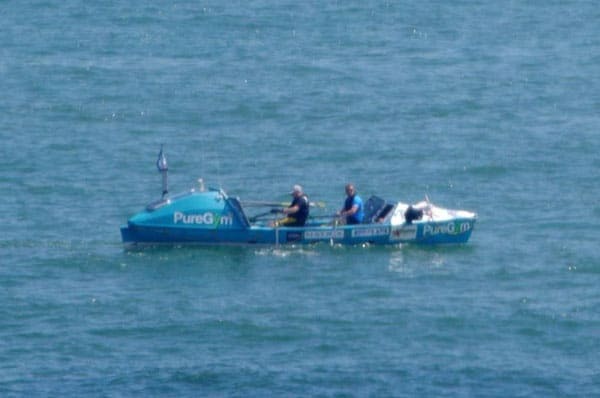 Pure Gym – who are making an supported record attempt to row 2,000 miles around Britain’s mainland pulled into Penzance this afternoon, to try and repair another electrical fault. During Wednesday and Thursday, their boat Pure Gym suffered total electrical failure and they had be towed by the RNLI to Salcombe for repairs. They rejoined the race yesterday but just as they were about to take the tide around Land’s this afternoon skipper Claire Shouksmith discovered an unexplained drain-down in the batteries. Tonight Mark John, of MJ Marine, was working to try and repair the fault, so Pure Gym can catch tomorrow morning’s tide to navigate around Land’s End, the most south-westerly point in the race.